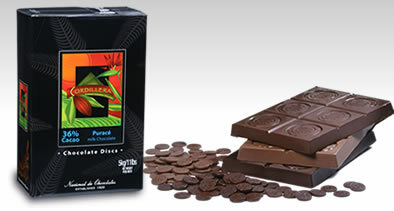 Fair Trade chocolate hit the big time this week as restaurant management giant Bon Appetit announced a commitment to introduce Cordillera Fair Trade Certified chocolate in all of its kitchens beginning on Valentine’s Day. This is a big deal–Bon Appetit provides cafe and catering services to corporations, colleges, and universities in 400 locations throughout 29 states. When the company makes a change in its food sourcing practices, it has a ripple effect. All Bon Appetit locations have been required to offer Fair Trade coffee since 2004, but this is the first time Bon Appetit has endorsed a company on a national basis. This is also the first time any large food management company has brought Fair Trade chocolate into its kitchens. In the past, Bon Appetit has only offered the chocolate in prepackaged individual bars. to the [Colombian] community in which the crops are harvested,” explains York. This won’t be the last Fair Trade initiative from Bon Appetit. “We’ve been looking for more opportunities,” says York. And that’s a good thing for the socially responsible Cisco, eBay, and Yahoo employees who rely on Bon Appetit for their daily nosh.